Question 1 What name is given to an animal which is an exact copt of its parent? Question 2 Name the parent sheep of which dolly was a clone? Question 3 Name the technique which is used in producing Dolly the sheep? Question 4 Name one famous clone? Question 5 What is meant by cloning? Question 6 Name 2 animals involved in the cloning of dolly? Question 7 List few advantages of cloning? Cloning is the production of an exact copy of an animal by means of asexual reproduction.Any two animals which contain exactly the same genes are called genetically identical. An animal which is genetically identical to its parents is called clone. The cloning of a large animal was successfully done for the first time by Ian Wilmut and his colleagues at the Roslin Institute in Edinburg.They cloned a sheep named Dolly from its parent sheep called Finn Dorest sheep. Dolly was born on 5th July,1996.Dolly sheep was the first mammal to be cloned. The cloning in animals is done by the transfer of nucleus of a cell.The nucleus of a normal body cell of the animal is transferred into an empty egg cell .The newly formed egg cell is allowed to develop normally.An exact copy of the animal is produced. Ewe is a female sheep.The two sheep which are involved in the cloning of Dolly Sheep were Finn Dorset ewe and Scottish Blackface ewe. 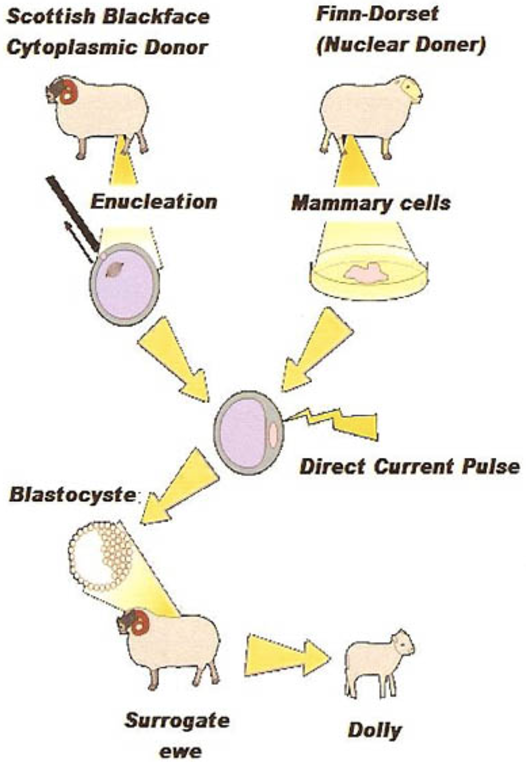 1)A normal body cell was removed from the mammary gland of a Female Dorset sheep. 2)An unfertilised egg cell was taken from a Female Scottish Blackface sheep and its nucleus was removed, leaving the egg cell empty. 3)The nucleus of normal body cell of Finn Dorset sheep was inserted into the empty egg cell of Scottish Blackface sheep. 4)The new egg cell was implanted in the uterus of another female Scottish Blackface sheep making it pregnant.After 148 days, this pregnant Scottish Blackface sheep gave birth to Dolly sheep. Though Dolly sheep was given birth by Scottish blackface sheep, it was found to be exactly identical to the original Finn Dorset Sheep from whose cell nucleus was taken. All the body cells of Dolly sheep contained the same set of chromosomes having exactly the same genes as the Finn Dorset Cells. Dolly was a clone of Finn Dorset sheep and produced several offsprings of her own through sexual means in due course of time.Dolly had exactly the a same genetic material as her real mother Finn Dorset sheep.Dolly dies in 14th February in 2003 due to a lung disease. The cloning of superior cows which gives high milk yield has become possible now.If a high yielding cow was to be mated with a bull for reproduction, then the resulting offspring cow may or may not be of high milk yielding breed. 1)This technique of cloning enable us to produce exactly identical copies of domestic animals having favourable characteristics. 2)A cow which gives high milk yields can be cloned to produce exactly identical cows which will give high milk yield. 3)A sheep which gives high yield of superior quality wool can be cloned to produce exactly identical sheep which will give high yield of superior quality wool.